Many of us are caught up in our fast paced society often forgetting to just stop and think. This causes us to do things over and over without realizing that there might be a smarter way to help us go forward. As a swim coach or a swimmer you should always be trying to adjust your ways and explore new things. May it be trying to swim in the mornings rather than in the afternoons or venturing out to swim backstroke if you only swim freestyle or working out in your bus ride on the way to work etc. etc. What I want to talk about today is slow swimming which is one of these things that is really outside the norm for most. I believe that learning to swim slow is one of the hardest things you will ever learn in swimming. Now you might be wondering, why in the hell would I want to do that. Well, hang on, let me explain a bit more. Let’s go back to your early years when you were learning to write. None of us (well maybe some prodigies :)) started to write in the speed we write now. We started by slowly practicing and perfecting each pencil stroke until we became proficient in each and every letter. Then we started to combine them together to form words, sentences and later on practiced our signatures to be as fast and as efficient as possible, so we don’t waste time with all those documents that require our signature nowadays:). Since swimming is composed of so many small moving parts of your body, it becomes a quite complex form of exercise, so slowing it down makes only sense. Except there is the problem of the water element where we feel like we have to move fast to stay afloat, thus omitting the actual act of learning how to swim slowly. The difference between swimming and writing is that we cannot start swimming slow at the start of our swim learning efforts, because it is so much harder than swimming at a speed which will cause the currents to lift your body up to float. However, we can at least fake it a little :). At the start of your learning, think of it more like doing the motion slowly while maintaining a good speed with your kick (use fins if your kick is not as efficient). Rushing everything will only lead to disasters and frustration. Yes, breaking down the swimming stroke into small parts is great for improvements, but unless you are able to slow down the stroke to practice the small parts and work on every single movement slowly, it will not work very well. 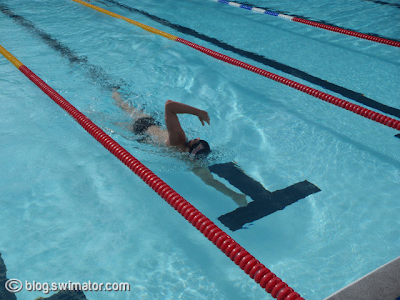 Slowing down your swimming will have an effect on your balance and coordination. If there is something wrong in your stroke, you will feel it right away as you won’t be able to slow down much without losing balance or going under water. As mentioned above, you don’t have to slow down everything at one time and swim like the Tsar of swimming. 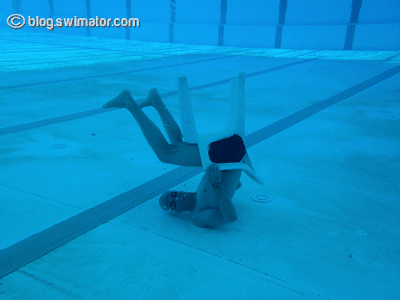 You can use fins to help you float a bit better, but then move your arms very very slowly to work on the correct movements. When you have mastered the basics of swimming, one of your ultimate goals should be to increase your time (you heard me right :) for 50-75 meters/yards. The longer it will take you, the better you are off as your balance and coordination have improved and your body control is much better. It is a very similar principle as with learning to swim backwards. So next time you are in the pool or are deciding what you will swim next, include a slow 75 in there and see if you can improve something. Don’t be sucked down to the need for speed level and learn to slow down. Do it often enough and you will see the improvement, I promise.